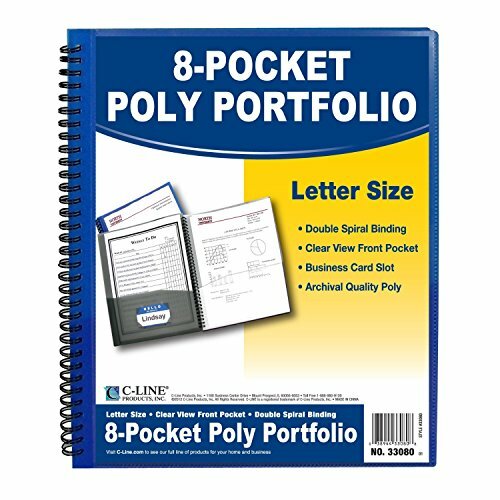 Organize projects, subjects, notes and more in one convenient place with a C-Line 8-Pocket Presentation Poly Portfolio. Each portfolio has 8 interior pockets to allow for detailed organization. Made of heavyweight archival-quality polypropylene, the C-Line 8-Pocket Presentation Portfolio features a clear-view front pocket for cover sheet, double spiral binding and business card holder. It is made for letter-sized documents and is available in an assortment of colors, which may vary. For over 60 years, C-Line has been a leading manufacturer of office supplies, with a product line that features storage, identification and organization products, including an assortment of new products to help you store, protect and organize your most valuable materials.